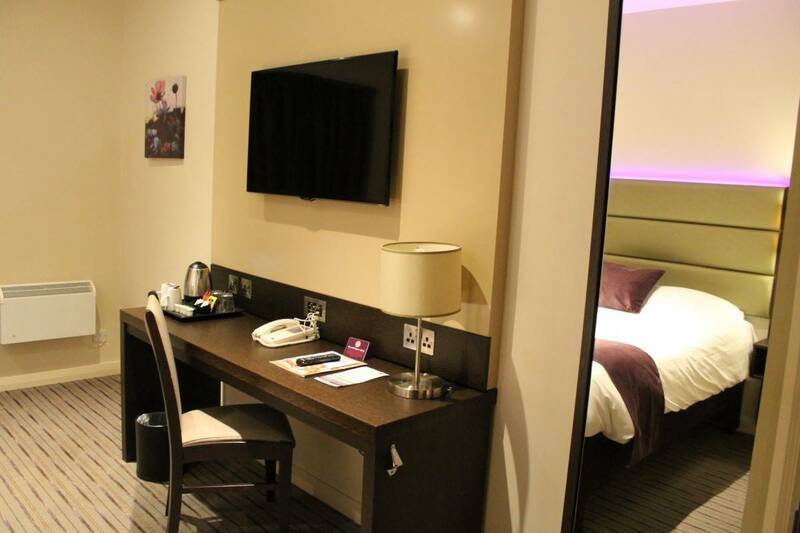 Last weekend I flew to Manchester for the annual Blog On conference and was invited to stay at the Premier Inn on Portland Street for two nights whilst I was there. Portland Street is really accessible and easy to find, being one of the main streets in Manchester but the Premier Inn is quite unassuming, just one small door leading into the reception area. The check in times are quite strict as they didn’t have rooms available before the 2pm check in – due to the generous 12pm check out time – I arrived at 1:30pm and went for a walk until 2pm but after that check in was swift and I was pointed in the direction of the lifts and my room on the second floor. 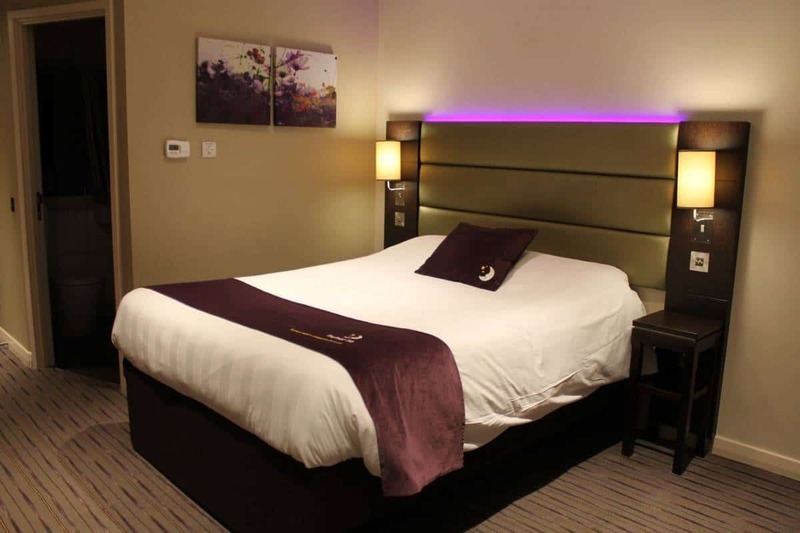 Although the reception area is quite small the Premier Inn really opens up on the higher floors – with the first floor mainly being home to the restaurant and bar – as well as where breakfast is served – and the other floors being home to many bedrooms. My bedroom was a good sized double with a seating area, desk, storage and a bright and functional bathroom. 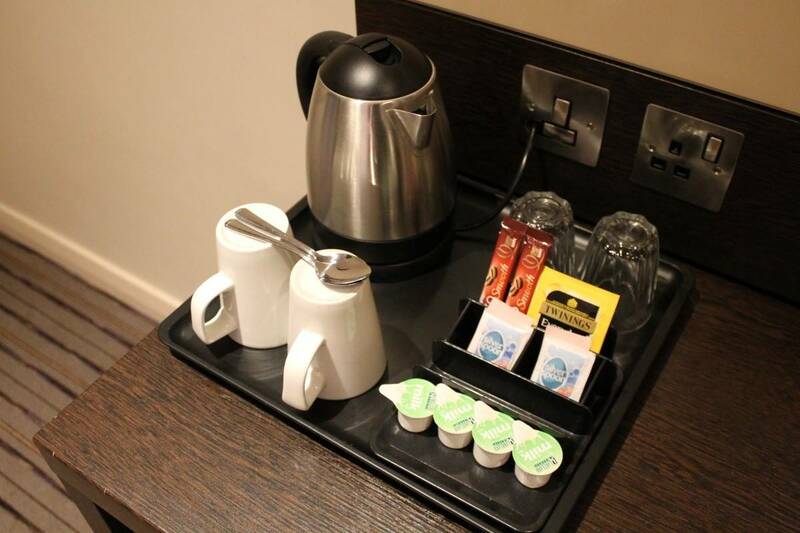 There was simple tea and coffee making facilities and a lots of plug sockets as well as one next to the bed – you’d be amazed how many hotels don’t have plug sockets next to the bed! A big bonus for me was free wi-fi. It wasn’t the fastest, and definitely better for writing and social media than doing anything with photos or videos but Premier Inn do offer an option to upgrade the wi-fi for just £5 for 24hrs. This is a really reasonable charge especially if you’re away on a business trip. 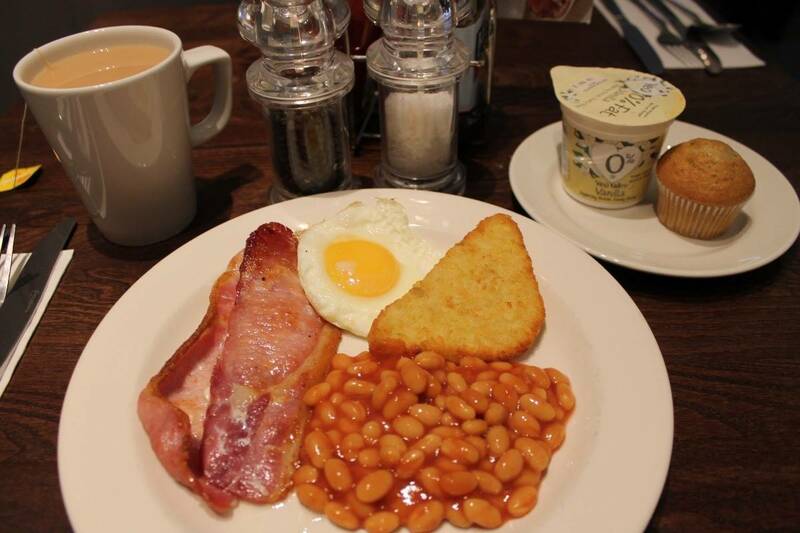 Breakfast is served in the Premier Inn restaurant – a restaurant and bar in the afternoon and evening and a buffet style breakfast in the morning. The restaurant is a lovely place to spend time with nice modern decor and a really nice feel to it. The breakfast buffet has a really good selection of cooked food items with fried and scrambled eggs but I was also offered freshly cooked poached eggs or an omelette if I had preferred. There was also a nice selection of fruit, yogurt, breads and pastries making it a breakfast with just so much variety. 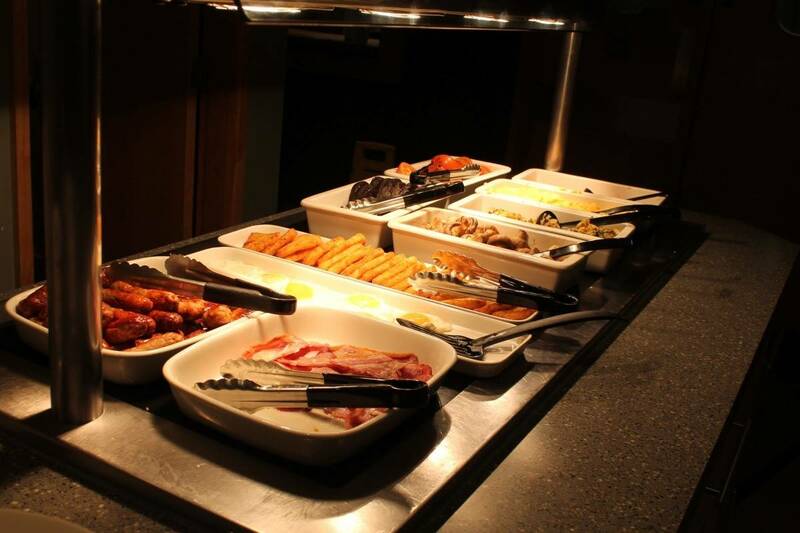 The breakfast area also included drinks – fruit juice, tea and coffee from Costa. 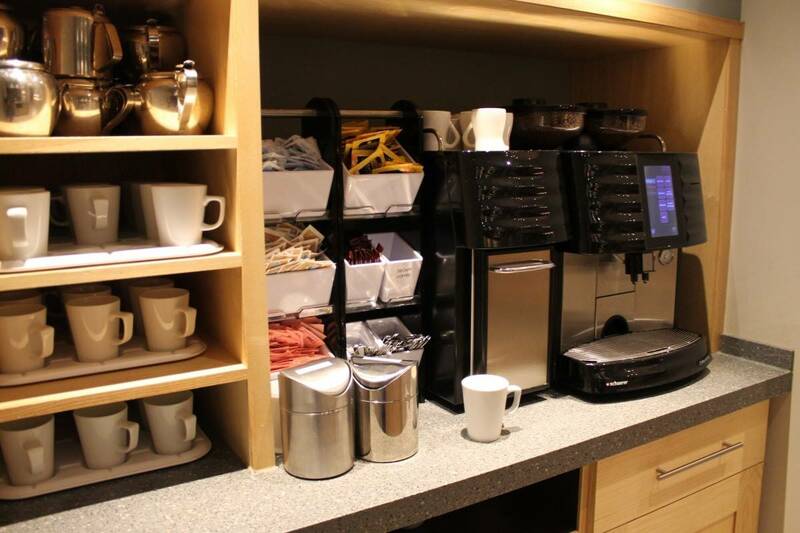 It was simple to make your own hot drinks and everything was really well stocked. 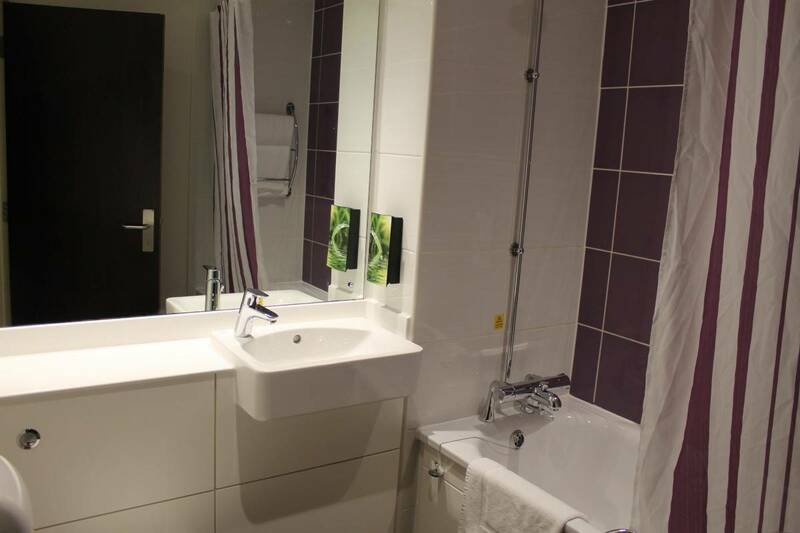 With the Premier Inn you use your door pass to access not only your room but also the lifts and the front door after 10pm. This makes the whole of the Premier Inn feel really safe and secure. The first night I stayed wasn’t the best night to be honest. I was woken up at 11:30pm by staff banging on my door to ask me if I’d left my iron on as they could smell burning. I completely understand that this is necessary for health and safety but after that I found it hard to get back to sleep and in hindsight I’m not sure there even was an iron in my room… At 2am people in the room opposite started shouting and swearing – I think Mr wouldn’t let Mrs back into the room or something. After twenty minutes I rang reception and asked them to sort it out and the noise stopped pretty soon after. Even with this disturbance it’s nice to know that Premier Inn do have a good night sleep guarantee so if you do have a disturbed night for whatever reason, Premier Inn will try and resolve it there and then but would also look into giving you a refund for that night’s stay too. My second night was much better – I still tossed and turned but that was down to me rather than any problem with the room. I didn’t have any noisy neighbours and the only real noise came from people going back to their rooms in the evening. The bed was comfortable, there were plenty of fluffy pillows and it was as good a night’s sleep as I could have hoped for. I haven’t stayed in a Premier Inn before but I wouldn’t hesitate to stay again. The whole set up was made to make everything as simple as possible – machines to check you in, pass cards to access everything and self service breakfast. Check out is as simple as leaving your pass card in a box next to the hotel entrance and I didn’t have to check out until midday either! I would definitely look to book Premier Inn for my next break away. Disclosure: I was provided with my stay and breakfast for the purpose of this review however all opinions are my own. That looks like a lovely room and I have massive breakfast envy! I like premier inn, I think they’re good value for money in terms of how well equipped they are.